I have read the GRECO report on corruption in the Republic of Ireland (GRECO 7: 17-20/12/2001). Worthwhile though I believe this report to be, it nevertheless appears to me that certain extremely important forms of political and legal corruption may have escaped the notice of the team of assessors: possibly because their stay in Ireland was too short, and/or the range of people they spoke with was too restricted? In so far as I am aware, the Republic of Ireland media have completely ignored the entire contents of the above mentioned press release of March 4th 2002. As you may know, there is a GENERAL ELECTION due to take place here in the Republic of Ireland in May of this year (which is of course just a matter of some weeks away now). Unless something is done about it soon, it looks as though all of the May 2002 General Election voters who depend on traditional media outlets for political news and information will be kept in complete ignorance regarding the very disturbing facts that are connected with petitions 809/2001 and 235/2002. Many of the corruption difficulties mentioned in petitions in 809/2001 and 235/2002 relate in one way or another to Article 28A of the Constitution of the Republic of Ireland (the section which covers the crucially important social matters of LOCAL GOVERNMENT, and LOCAL DEMOCRACY). Among other things, and as a result of what I see as high-level political and legal corruption, a Waste Management Bill involving super dumps passed into law in 2001: even though it clearly conflicted very badly with Article 28A. The combination of political and legal actions involved in the lengthy journey of bringing this law to fruition appears to have the tacit approval and support of the media throughout the long crawl through all of the legal technicalities discussed in the Senate and elsewhere: with the core issue of Article 28A never once specifically drawn to the attention of the public by the media (as far as I know). Most amazing of all (as I see it), it appears that President Mary McAleese (herself a lawyer) had no qualms at all about signing the necessary papers which enabled the Waste Management Bill to become Law. This "super dump" situation appears to me to be unusually bad: partly because of all the negative reports in circulation regarding the serious health hazards for people (especially pregnant women) living close to such establishments. The reports I refer to include the very reputable Eurohazcon Report (of 1998) on landfill sites. Mindful of all the justified concern that there appears to be regarding the rights of unborn children in this State, and of all the time that the media, the lawyers, and the politicians have spent discussing this subject in public during the past several years, they appear (until very recently) - and for reasons best known to themselves - to have almost completely ignored information of the kind contained in the Eurohazcon Report: which has been available since 1998 ??? If the European Union has any group within its organisation which polices (in "real-time") the kind of ongoing "political / legal / media" type of corruption referred to in this communication, it would be much appreciated if you could forward a copy of this e-mail to them as soon as possible please for their attention. As I do not know if any EU group of the kind referred to in the paragraph immediately above actually exists, I am copying this e-mail to a number of other EU personnel outside of your GRECO Group: in the hope that one or more of them might be able to help (in some way or another) with what I regard as a very unhealthy social and political situation: which is happening RIGHT NOW here in the Republic of Ireland IN THE RUN-UP TO A GENERAL ELECTION. I feel I should stress that I believe it would be infinitely better to have a team of anti-corruption investigators look into this matter now: rather than AFTER the May 2002 General Election. As I think you will know possibly, we already have a number of TRIBUNALS in progress here that are investigating large-scale corruption (involving senior politicians) which took place in recent years; and, I for one would prefer not to see any additions to the present number of these tribunals: if this could possibly be avoided through effective European Union anti-corruption policing carried out in the "here-and-now" of this "live" situation. 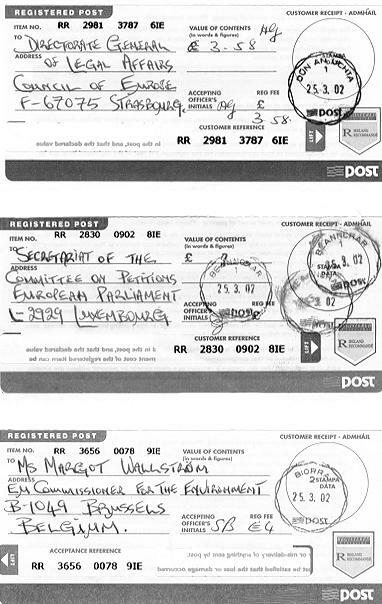 on March 25th 2002 to the three addresses shown on the Post Office receipts below. Except for normal Internet search engine purposes, none of the electronic text (or photographic material) on this page may be copied in whole or in part without the prior written consent of Mr. William P. Finnerty (contact information provided below). IT IS PERMISSIBLE for any individual person to make a printed copy of this page for their own personal use without seeking the author's permission.